by Saad Sirop Hanna, with Edward S. Aris. University of Notre Dame Press (Notre Dame, Indiana, 2017). “You don’t hate us, do you?” One of Father Sirop Hanna’s captors asked that question as the young Chaldean Catholic priest’s month-long captivity in Iraq came to an end. A continual flow of grave threats and painful moments mark this book’s pages. They are marked, too, by the author’s refusal to allow his captivity to justify hatred toward Muslims. The frequent presence of his Muslim guard, Abu Hamid, highlights this subtheme. Hamid’s kindnesses toward him shine like a light in darkness; something close to friendship is forged. 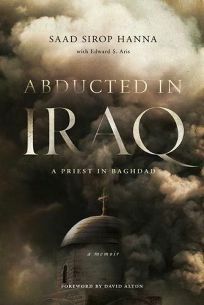 “Abducted in Iraq” is a gripping account of profound faith, authentic courage and hope against all odds. Not surprisingly, the priest’s cruel confinement led him to ponder life’s ultimate questions, like love’s meaning, God’s presence and action, and goodness itself.